Comparing radical forces and ideologies is the essence of finding the difference between extremism and terrorism. The extremist sets specific ideologies before him and lives life accordingly. The terrorist, on the other hand, uses extreme ideas to provide the background for his terrorist activities and moves ahead towards the extreme goal that he had in mind. The terrorist will use force and subversive activities to further his goals. An extremist can continue to support his extreme ideals and not be a supporter of terrorism. An ‘absolute pacifist’ for example will not resort to any form of violence while a ‘contingent pacifist’ accepts some violence for self defense. Terrorism is seen to be a public act of violent behavior that is used to advance the terrorists ideals in political, social and religious arenas. It would be fair to say that an extremist may have leanings towards terrorism and support terrorist activities, but an extremist does not have to be violent and cause bodily harm. Terrorist activities are violent, anti-social and harmful. Extremism is opposition to basic values found in democracy, rules of some laws, and respect for or tolerance of individual rights, their faith or beliefs. Extremists voice their opinion in different ways and not always in a violent manner. Extremism may be the root cause or the ideology behind terrorist acts of violence. Extremists often propagate their ideals through distribution of literature or holding rallies and voicing their opinion. It has been noted that extreme behavior can often be appealing to the wealthier activists who are able to sponsor leaflets and extreme propaganda. Criminal Extremism can become a social danger. Extremists can target political groups, racial, ethnic and religious ideologies resulting in hatred towards another society or organization. Extreme beliefs could be the mental attitude behind a terrorist act. Extremism is motivated by different forms of social hatred towards other groups. These could be religious, ethic, political or even social groups. Extremists have radical ideas that they encourage through propaganda and meetings of like minded people. 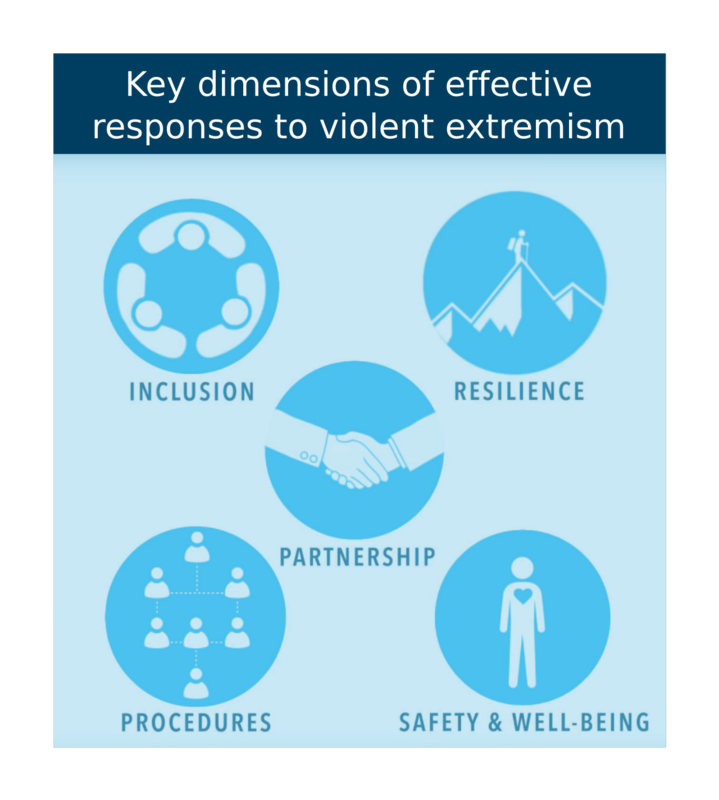 Violence is not normally the motivation behind the extremist, but with continued support and propaganda, and due motive, the extremist could become driven to be part of a terrorist organization supporting a more radical approach. Terrorism is the violent end of extreme behavior. Terrorism endangers peoples lives and is aimed at harming other people with little or no respect for the consequences of the behavior. Terrorism causes damage to property and to social normality. It is aimed at interfering with and causing harm to society. Extreme ideology may be the force behind terrorism and terrorist activity becomes the means to show how the activists feel in their given situation. Terrorism has its origins in the French revolution and comes from the French word terrorisme also related to the Latin word terrere, meaning intimidate. Terrorism is a criminal act and threatens individuals as well as different population groups. People are intimidated by terrorism as it can affect all walks of society, even innocent bystanders. Extreme ideals about different principles. Radical behavior and mass hysteria. A desire to cause harm to society and oppositional groups. Both groups may support political ideals, but the terrorist group will be prepared to incite and attack to cause bodily harm. The motivation behind the terrorist and the extremists could be either right of left wing supporters, but the extremist would not normally resort to physically harmful behavior. In social circles the extremist may be accepted and simply reviewed as an outspoken individual with a cause. The extremist is not out to cause bodily harm or damage to property and therefore poses less of a threat. The terrorist is not socially acceptable except by their own groups. Terrorism is seen to be harmful to society and lives have been lost as a result of terrorist behavior. Economically the terrorist cause damage not only to property, but to the economy and the stability of the society that it affects. Terrorism does not raise the standard of living or lift the economy. Countries are less likely to invest in a country over-run by terrorism. Although extremists make themselves known in the different aspects of society their mode of behavior is generally peaceful, unless they have a violent agenda, in which case they may have leanings towards terrorist activities. There are emotional implications attached to extreme behavior and to terrorist activities. The fear and the terror experienced through terrorism makes this a more emotionally charged situation. The terrorist is incited into extreme behavior and the people affected by terrorist attacks feel the fear and pain behind terrorism. Extreme behavior, generally speaking, excites the groups belonging to the extreme principles they are supporting. There is not always a leaning towards violence. In some situations extreme behavior is dismissed as eccentric, but there maybe occasions when extremists resort to more violent demonstrations of their beliefs. Throughout history there have been extreme groups canvassing for different political, religious and ethical reasons. Groups that have been suppressed or overlooked may rise up and show their dissatisfaction towards the governing or ruling parties. Terrorism has become more problematic in recent years as groups with access to weapons and the backing of influential political groups are able to make more of an impact. Terrorist behavior has led to very tragic losses on a larger scale than in the past. Terrorist groups can take over and occupy countries causing physical and emotional harm. Extremism and terrorism are alike in the radical mindset they support but not in the way they activate their supporters. Their differences appear through the amount of violence attributed to terrorism while an extremist may not necessarily be violent. A terrorist by definition is violent. Extremists may be tolerated in some social circumstances and their activity condoned as eccentric. However, there are aspects of extremism that are not tolerated and the views of the extremists are shunned. In many religious and ethnic groups tolerance for their opposition of people of different beliefs would result in the opposition being unable to practice their beliefs. In these circumstances the oppositional group may resort to violent or subversive behavior. Extremists may be involved in the same cause, but at opposite viewpoints of the situation. During the American civil war the two opposing groups called each other extremists. Those fighting for the North as opposed to the countrymen fighting for the south. In this situation the extreme views led to war, but a civil war not a terrorist attack. There have been some disagreements within the international community with regard to defining terrorism. The difficulty is part of defining what is a legitimate struggle against oppression or foreign occupation which may not necessarily be an act of terrorism. However, attacks causing bodily harm to innocent citizens would constitute as acts of terrorism. Generally speaking therefore extremism is the support of an ideology and may not be of a violent nature. An extremist ideology could lead to terrorist behavior. Terrorism is usually defined by its violent behavior especially violence towards innocent people and their property. Christina Wither. "Difference Between Extremism and Terrorism." DifferenceBetween.net. 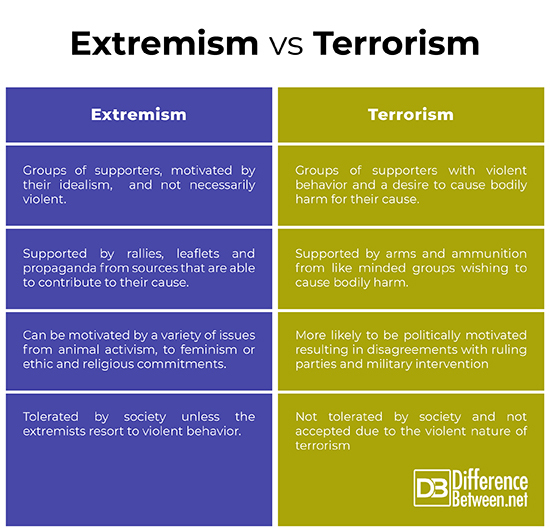 March 18, 2019 < http://www.differencebetween.net/language/words-language/difference-between-extremism-and-terrorism/ >. Prof. Austin greg. 16.11.2018. Extremism or terrorism, spot the difference. Www.unsw.adfa.edu.au/extremist-or-terrorost-spot-the-difference. Pub.ADFA Australia;oa defemce force Academy. Reviewed 04/02/2019.